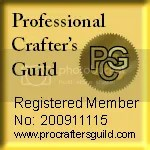 I just thought I would take a few minutes and give you all a little bit of an insight of my life as a stained glass artist. When I finished typing this I re-realised quite how much work it takes to create the stained glass pieces I offer for sale. First up I need glass! LOTS of glass! Plus on top of all that I also have all my jewellery making supplies.. 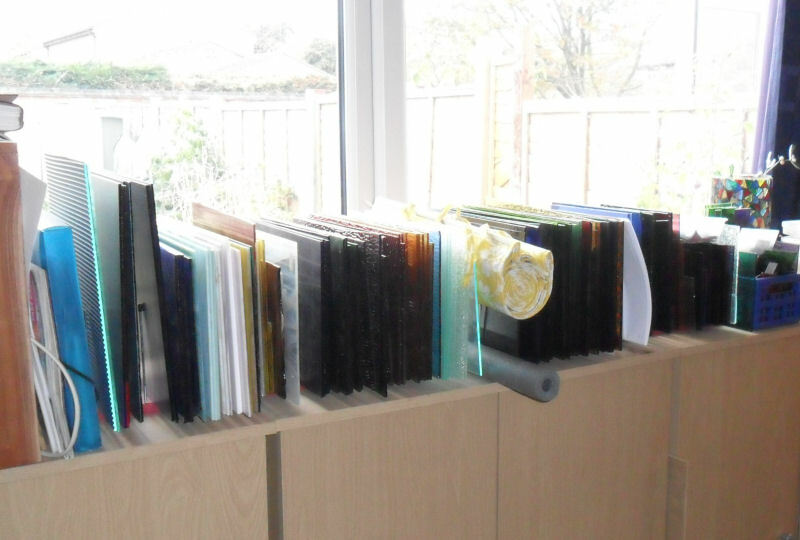 I have a beautiful bead collection now, sterling silver, silver plated, copper and coloured plated wire and findings, plus another full compliment of jewellery making tools, various bits of equipment..
Oh and my ever increasing book collection! My work space is getting a little crowded now! Most of my stained glass creations start out as a flat piece of coloured glass before I set to it with my trusty Sharpie marker pens, black for light coloured glass and the silver ones for the darker colour glass as it shows up so much better! I draw my designs on the glass and then move onto the next stage, cutting and breaking the glass. A steady hand is essential for this part but if I have a bit of a ‘oops’ moment I have my glass grinder to hand to smooth any parts which aren’t quite right. 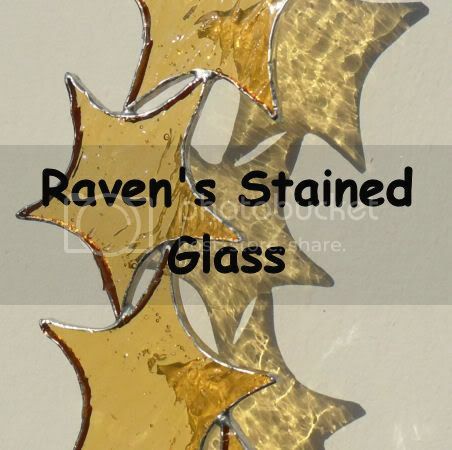 All of my stained glass stars make a trip to the glass grinder to be smoothed to perfection as I really can’t have stained glass stars with nasty edges as they wouldn’t look right. The next stage is to apply the copper foil to the stained glass shapes and then this has to be ‘burnished’ which basically means it gets ‘squished’ onto the glass so it sticks properly and is nice and smooth. Next up flux is applied to all the copper foiled edges as this makes the solder stick to the copper. Then things get HOT HOT HOT! Time to ‘tin’ the copper foiled edges. Tinning is when I apply a thin layer of solder to the front, back and sides of the foiled glass piece. (NOTE TO SELF – if the soldering iron slips it is NOT a good idea to try and grab it! Nasty burns can ensure as a result of this!). Next up the pieces of tinned glass are put into their final positions and soldered together to create the design I have in mind. I’m a bit picky about soldering and love to see a beautifully smooth piece of solder work. My birthstone pieces have all their wire decorations added here so I can join the pieces with my beaded links later on. Once this is done and the piece has cooled down we move onto the next stage. A trip to the kitchen is next (normally via the kettle!) and all the pieces of glass work are washed in warm water with a splash of Fairy Liquid to remove any traces of flux. I also wipe all my solder lines over with some fine wire wool to remove any ‘spotting’ or marks caused when the flux and solder mix. I LOVE LOVE LOVE my solderwork to look all shiny and polished when a piece is finished and so a few minutes with the wire wool sorts that out for me. If I am applying a coloured patina to my glasswork, as you can see on some of my terrariums and Air Plant Holders, the piece is dried before I ‘paint’ on the patina and the piece is washed again carefully. 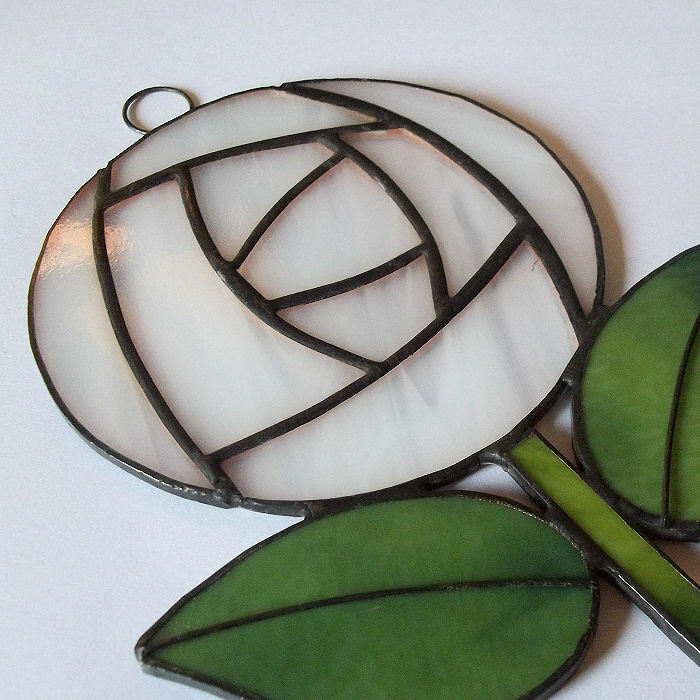 A black patina applied to a white stained glass Rennie Mackintosh style rose suncatcher. The next stage (yes there is more!) is for me to add any ‘extras’ to the piece. As you can see by browsing my shop many of my pieces are hung from silver plated chains or ribbons, these are added at this stage. Some of my other pieces, especially my birthstone pieces, are joined with beaded links. I make all of these by hand and I will occasionally spend an evening in front of the TV with my beads, wire and tools making little beaded links and the little wire loops to add to my stained glasswork so I have a bit of a stash tucked away. The beaded wire links on a Sapphire birthstone suncatcher. In this case the links are genuine sapphire and crystal beads. Now do you think I’m finished? Not yet! The last stage is getting them from my work space to the ‘internet’. I take a series of photographs of all my pieces, select the best ones, crop them and make them ‘pretty’ before creating a listing on my website for the world to see. With July literally just around the corner I thought I would quickly pop up a post to show you some of the stained glass suncatchers I have created using red stained glass to represent the gorgeous Ruby. 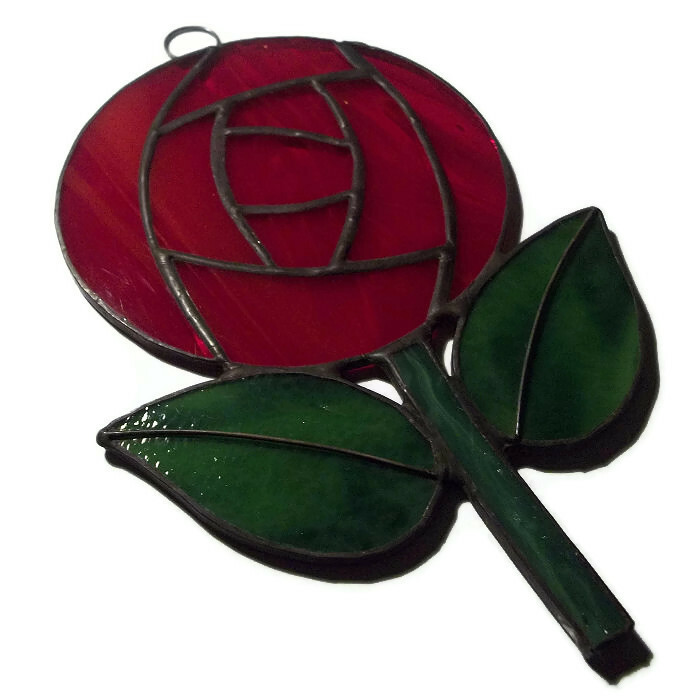 Each one of my ruby inspired stained glass is handcrafted in my studio and would make a lovely gift for a friend or loved one if they were a July baby. I hope you like them as much as I enjoyed creating them. If you would like more information about the pieces please click on the photos to be taken to my website. Little squares of red stained glass joined with red beaded links. Red stained glass stars in a beautiful cascade design. A pretty suncatcher made using ruby red squares and hanging from a silver plated chain. A gorgeous circle of ruby red stars hanging from a 15cm silver plated chain. A single ruby red star hanging from a 10cm silver plated chain. I decided to be a little brave this year and booked a stall at the Banbury & District Show 2013 at the Spiceball Park. After a couple of weeks of some quite intense creating the day dawned and while it started out a tad cloudy the forecast was good. Everything was packed up the night before and we were ready to go. My daughter Romana was enlisted as my helper for the day and she was offering some of her memory wire bracelets for sale. We both thought it looked lovely and we attracted quite a lot of interest. A selection of my handcrafted jewellery. My Tree Of Life pendants created using semi precious gemstones attracted a lot of interest. A selection of my stained glass suncatchers, mosaic coasters and Air Plant terrariums. Loving my new Air Plant Terrariums on the left. It was a really lovely day, the weather was lovely even though it was a bit chilly in the morning and I’d accidentally left my jacket in the car 😦 But it warmed up later. There was an awful lot going on and we both had a little time to have a wander round and have a look at the rest of the attractions, events and stalls. 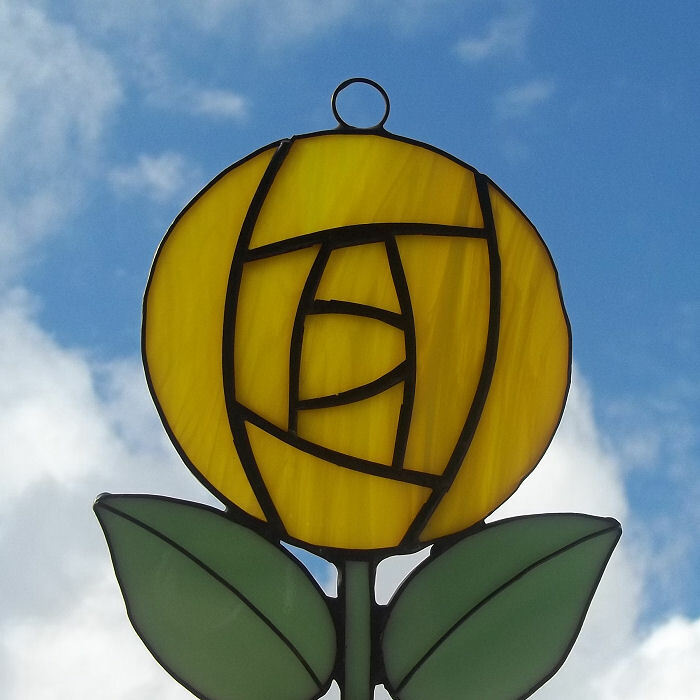 It must be something to do with spring being on the way but I seem to have gone into ‘flower mode’ at the moment and I’ve been busy creating some pretty new Charles Rennie Makintosh inspired roses. I’m rather pleased with the way they have turned out and they looked beautiful hanging in my window while I was photographing them. My particular favourites are the red and the white ones. Red because.. well girls love red roses and white because I think the combination of the black patina on the solder works really well with the white glass. These pretty roses would be a perfect way of having flowers in bloom in your house all year round and the upside is that they need no care at all! WOOHOO!! Christmas is just around the corner 🙂 and for me the preparations started back in JUNE!! Yes, you read that correctly! 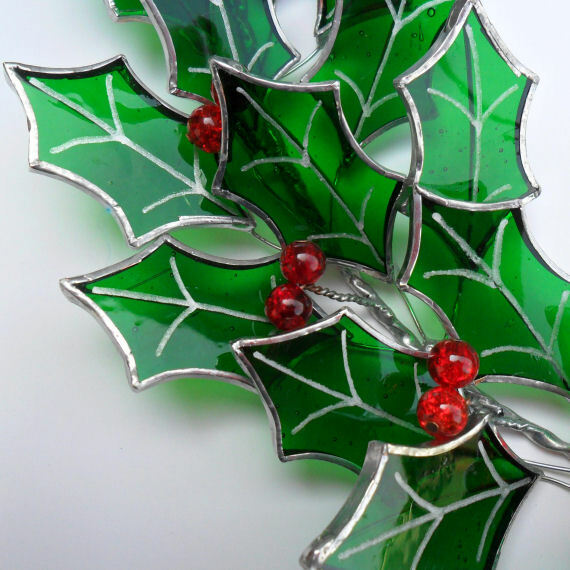 The sun was shining on one of the rare sunny days we had this year and there I was cutting green glass into Holly leaves and red glass into Christmas Tree baubles! Some of my 2012 collection have been seen before but I also have a lot of new goodies on offer too. I’ve recreated my stained glass Holly Wreath with added improvements 🙂 plus I’ve created a brand new Holly Suncatcher to add to the collection. I’ve recreated my dinky little stained glass Angel Christmas Tree decorations this year too and I’m offering these for sale in a much wider range of colours. At the moment there are 10 colours in the range, including a beautiful new white Angel, and I’m sure the colour choice will increase over the next month or so. Please remember that if you would like the Angels in a colour not currently on offer I can also make to order in the colour of your choice. At the moment I’m cutting a lot of glass for yet another range of Christmas Tree decorations but you will have to wait until next week to see them. It’s all kind of hush hush at the moment but I’m on holiday from my day job and plan to spend the week working with my glass creating what I hope to be a beautiful range of decorations.